As a slew of health insurers retreat from state exchanges, Affordable Care Act stakeholders face a communications challenge to reinforce the need for sustainable and preventive care in a system that should become less expensive as illnesses are better managed. Covered California is launching a major comms blitz to target diverse aduiences. The significant pull-back of high-profile insurance providers from the Affordable Care Act has left state-run health exchanges and the Obama administration facing a difficult communications challenge. Outgoing President Barack Obama’s signature law, widely known as Obamacare, was designed to provide affordable and competitively priced health insurance for more than 20 million Americans without coverage. But now major news media from CNBC to The New York Times are proclaiming the arrival of the "Obamacare death spiral". The consensus is that not enough young, healthy Americans have signed up to balance out the older, sicker enrollees; Congress hasn’t done enough to help insurers cover those costly patients; and the act simply isn’t sustainable long term without major changes. Both Aetna and UnitedHealth Group, two of the nation’s largest health carriers, positioned their retreat from state exchanges as a financially driven business decision. In a six-paragraph announcement last week, Aetna said its individual policy group lost more than $430 million since the exchanges launched at the beginning of 2014, due to a larger than expected share of "individuals in need of high-cost care." Aetna said it would reduce its public exchange participation from 778 to 242 counties next year, maintaining an on-exchange presence in only Delaware, Iowa, Nebraska, and Virginia. In April, UnitedHealth Group said that in 2017 it would exit most of the 34 states where it offers plans on the ACA exchanges, for the same reasons cited by Aetna. And Aetna reportedly warned the government in July it would drastically reduce its Obamacare footprint if its proposed merger with rival Humana was blocked by the Justice Department. Shortly after the department filed suit to block Aetna’s takeover, Humana also announced it would stop marketing its exchange plans and will only offer individual plans in 156 counties, compared to 1,351 this year. While Humana has not responded to questions about what impact the Justice Department’s move had on its decision, if at all, Richard Sorian, who leads FleishmanHillard's Washington, D.C. healthcare team, says it smacks of political jockeying. "The pull-out is a business decision, but the question on the edges is whether some politics is going on related to the mergers," says Sorian, who prior to FleishmanHillard was at the DC Health Benefit Exchange Authority, the organization that oversees enrollment to the insurance exchange in Washington, D.C. created as part of the Affordable Care Act. He also previously led communications for the Department of Health and Human Services, the federal department the ACA falls under. "Big publicly traded companies don’t care about the federal election, but they’re really interested in getting these mergers approved," he says. "Their business plan may have been based on a successful merger, and now that isn’t happening, at least not for another year - they could have had to do some scrambling." The public exchange reductions couldn’t come at a worse time for Obamacare. The fourth open enrollment period starts November 1, leaving 14 state-run health exchanges scrambling against a sweeping narrative that healthcare insurance will no longer be affordable, because of less choice and steep premium hikes. Republican presidential candidate Donald Trump, who wants Obamacare repealed, will also likely make a lot of noise about its "failure" leading up to the November 8 election. "Before every open enrolment period, there have been people who don’t like it and say, ‘Finally, the sky is falling. Obamacare is going to collapse.’ But that is not anchored in analysis, it is anchored in politics," says Peter Lee, executive director for Covered California, the health insurance exchange for the state. "The job of state-based exchanges and the federal marketplace is to stand aside from the politics and say, ‘this is how you can benefit from coverage and this is how affordable it can be.’"
While the scale-back of Aetna and UnitedHealth Group made national headlines, Lee says those two plans have not done well in the individual market. He also notes the exchanges are competitive marketplaces and that insurers will come and go. "We have to be a little bit of Sgt. Joe Friday from Dragnet and say, ‘Just the facts,’" Lee tells PRWeek. "And the fact is the vast majority of Californians and Americans still have a lot of choice. Consumers just have to look at what is available to them locally." In California for 2017, he notes 92% of enrollees have three or more plans to choose from, and the remainder have two. To boost enrolment – and counter negative headlines – Covered California is launching a major comms blitz, including targeting ethnic media. Twenty-two percent of the state population eligible for insurance subsidies are Asian-American and 40% are Latino. "It is hard to get on the six o'clock news in L.A. for CBS, but we can be front and centre on the stations Koreans watch," says Lee. "We’ll be out there in Spanish and Asian languages as much as we are in English." Covered California works with Ogilvy PR on its comms. Outreach will also include a bus tour stopping in key districts state-wide to help with enrolment assistance. In addition to the challenge of communicating against the noise "of opponents who seize on any development as yet more evidence Obamacare is failing," David Bowen, global lead for the health practice at Hill+Knowlton Strategies, says states face a steep learning curve in reaching people who are eligible, "because they represent a demographic they are not used to communicating with." "It’s a very diverse cultural, linguistic, and geographic population," adds Bowen, who was instrumental in moving the Affordable Care Act through the Senate as staff director for health for the US Senate Committee on Health, Education, Labor and Pensions under the late Sen. Ted Kennedy (D-MA). 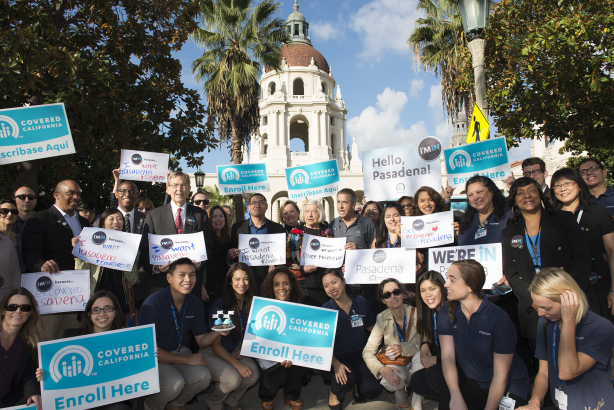 "States like California have been combining multiple plans available to different communities into these kind of health and assistance fairs, and using those to galvanize excitement around ACA plans," says Bowen. "It is essential to make sure materials are available in multiple formats and languages, and to reach these people where they are." Thirty-seven states have opted not to create their own exchanges, rather using the healthcare.gov federal insurance exchange platform. While some states such as Illinois have created a unit for marketing the federal exchange, by and large those states have no role in promoting it, says Sorian. He believes the White House must launch a campaign targeted at people in those states, a tricky challenge "because they don’t have much practice communicating on a state-by-state level." "They typically communicate in broad strokes," he adds. "The problem is consumers may hear a message that may or may not apply to them and get worried and confused about their insurance coverage." One of the biggest problems of the program, so far, he says "is the lack of millennials and young invincibles who have enrolled in the plans." "Studies suggest they are not buying homes, they’re renting, and they’re being very cautious about spending money on anything, including health insurance," he notes. According to a report in The New York Times, The White House is planning a marketing campaign to get new participants into the ACA exchanges. The push would feature testimonials from the newly insured and outreach to young consumers who paid tax penalties for not enrolling. Gil Bashe, managing partner, global health at Finn Partners, says there is an opportunity for government to partner with health communicators on a conversation about the challenges to the Affordable Care Act framed within the larger context of public health and social mission. "Right now, we’re using the Affordable Care Act as a mechanism to unify our health system, so we can provide access to care for people who are well and have had our help, and to people who have not been well and have not had our help," says Bashe. "There’s a large patient population entering the system now who have serious chronic illness and it is costly." "Over time, as their illnesses get better managed, so too will the costs," points out Bashe, who says this point is so far missing from the dialogue in the media. Those stakeholders could include more state-based insurers, such as Kaiser Permanante, which operates a non-profit plan, and Blue Cross Blue Shield state-oriented plans. Both express their commitment in statements and online to the Affordable Care Act. "There is also an opportunity to partner with groups such as the American Heart Association and American Diabetes Association, because they’re becoming very attentive toward the Affordable Care Act population," says Bashe. "These organizations realize they can’t achieve their awareness goals unless people get in the system and get preventative care for their conditions. It’s time for great collaboration among plans and third-party organizations to communicate the need for these plans."